We are leading producer and distributor of lighting, heating control units and air conditioners. We also produce household electronics such as clocks, alarms. Our major aim is to provide you with the highest quality products that will fit your needs and expectations. The company has implemented Quality Management System ISO9001:2000. TUV Rheinland Polska is the unit , which certificates and controlls system. We constantly carry out the research to improve our products. 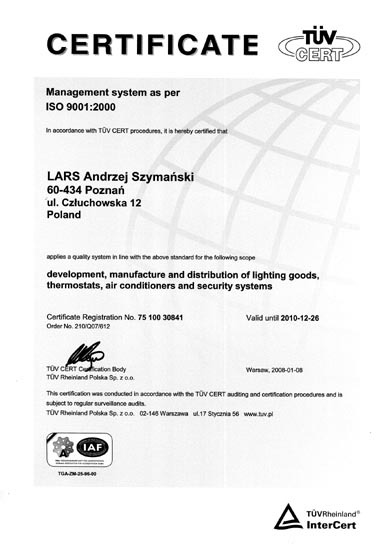 The LARS Company performing the obligation, consequent on the used electrical & electronic materials law from 29th of July’ 2005, has been registered in Environmental Protection Main Inspectorate under following number: E0001051W. Concurrently, we are proud to announce that our company entered into AURAEKO Recycling Organization AURAEKO of which we are the cofounder.